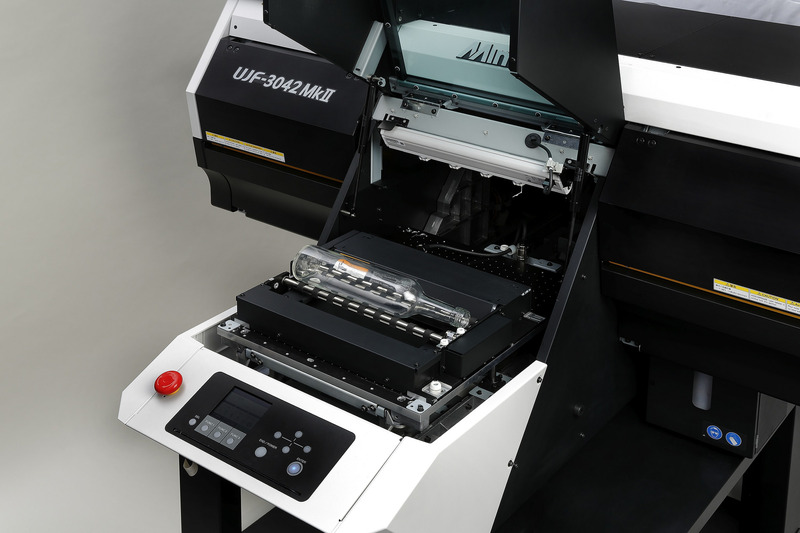 Mimaki has announced that it is making its popular Kebab option available for the new UJF-3042MkII and UJF-6042MkII; its latest generation of UV flatbed printers. Using rotary rollers, the Kebab option enables printing directly onto a wide range of cylindrical objects and is also available for the UJF-7151plus printer. The UJF-3042MkII is compatible with the Kebab MkII model, while the MkII L model is suitable for use with the UJF-6042MkII and the UJF-7151plus printers. 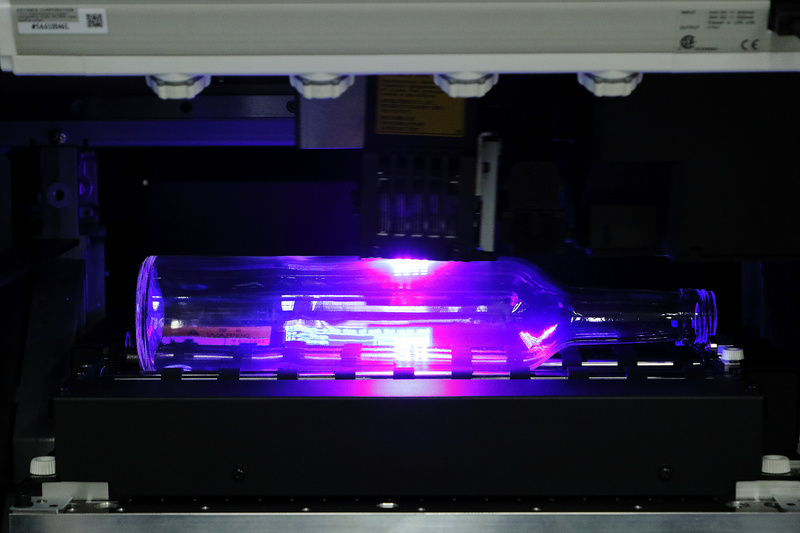 The innovative device enables high quality printing on cylindrical products with diameters from 10mm to 110mm, including wine and water bottles, seals, candles, cosmetics bottles and more, making it possible and affordable to produce on-demand original products in short or even individual runs. The Kebab option has historically enabled Mimaki customers to be highly creative, opening up new business and revenue streams in sectors such as the cosmetics industry, where regulatory requirements differ between countries. It also makes one-off, direct-print labelling affordable; be it for a personalised product or as a gift. Mimaki also highlights the wine bottle sector as a growth area with commemorative and celebratory personalised prints proving popular. The new UJF-3042MkII and UJF-6042MkII printers feature print speeds that are 20% faster than its predecessors. These machines, like most printers from Mimaki, also have the ability to use different types of inks, thus supporting a very wide range of applications. In addition to the durable inks that adhere well to glass and other substrates taking advantage of the Kebab option, LUS-120 inks can also be used for printing on soft material surfaces such as membrane switches or wallet smartphone cases, since they can stretch up to 170% without cracking when pressed or folded. Moreover, the LH-100 rigid inks are perfect for accessories or stationery products that have to withstand high levels of abrasion. These inks, when used with Mimaki’s PR-200 inkjet primer, are also an excellent choice for printing on glass, metal and resins, which has traditionally been difficult for UV-curable inks. With Mimaki Clear Control (MCC), the clear varnish can be used to both highlight areas with spot or flood coating, as well as to deliver embossing with multiple passes. Mimaki’s optional Kebab device extends the capabilities of its new UJF MkII rangeExclusively distributed in the UK and Ireland by Hybrid Services Ltd, the company’s National Sales Manager – Industrial Products, Stuart Cole anticipates a positive take up of the Kebab. To support increased productivity and profitability for sampling, retail and printing business, the new UJF-3042MkII and UJF-6042MkII printers have the ability to print on objects up to 153 mm thick at higher speeds. The new range has advanced mechanical functionality, featuring a print table that moves during printing to reduce printer vibration, deliver precise dot placement and enable high quality printing on a wide range of objects and materials. The printers are designed to deliver easy operation with automatic detection and cleaning of clogged nozzles, substituting good nozzles for printing during this process. This allows constant printing and reduces waste due to defective nozzles. Mimaki Circulation Technology (MCT) circulates white inks at regular intervals to prevent pigment sedimentation that can lead to nozzle malfunction. Especially important in retail environments; the fully enclosed print table improves safety while maintaining print quality by keeping dust and other contaminants out of the system. More details about Mimaki products, including its full range of printers and inks, can be found at www.hybridservices.co.uk.